Orthopaedic oncologists are a rare breed. Scattered throughout the most populous cities in the U.S., their expertise is hard to come by. That’s why Lisa Kafchinski, M.D., is such an asset to Texas Tech Physicians of El Paso (TTP El Paso). Without the specialist, some cancer patients from El Paso County would have to commute at least 265 miles — to Albuquerque, New Mexico — to find the next closest orthopaedic oncologist. 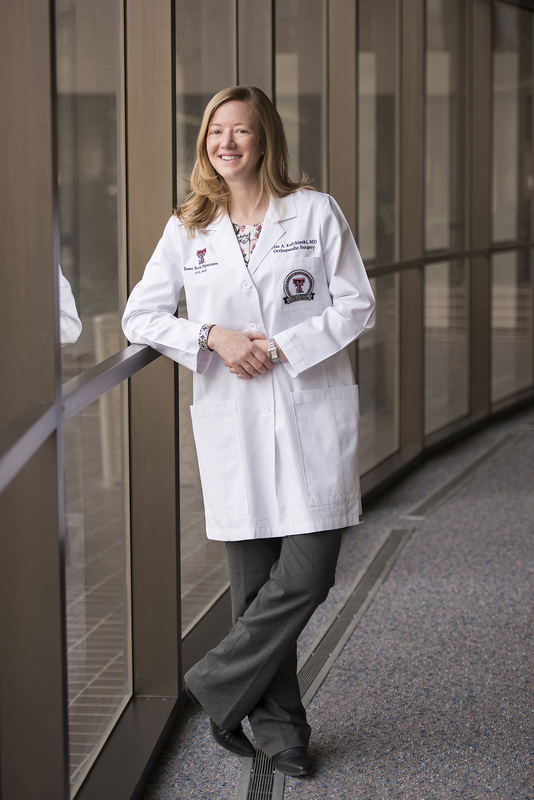 Recruited by the Department of Orthopaedic Surgery and Rehabilitation in 2016, Lisa Kafchinski, M.D., is TTUHSC El Paso’s first orthopaedic oncologist — and the only one in the region. Orthopaedic oncology is a highly specialized field that focuses on musculoskeletal cancer — cancer of the bones, muscles, blood vessels and surrounding soft tissues. Recruited by the Department of Orthopaedic Surgery and Rehabilitation in 2016, Dr. Kafchinski’s experience includes a competitive musculoskeletal oncology fellowship at the University of Toronto. There, she received intensive training in the diagnosis and treatment of musculoskeletal tumors. These tumors may materialize as a simple mass in the bone or muscle, or result when another type of cancer, like those of the lung or breast, metastasizes — often to the bones nearby. Amr Abdelgawad, M.D., chair of the Department of Orthopaedic Surgery and Rehabilitation, is glad to have the orthopaedic oncologist on the team. Dr. Kafchinski still remembers her first patient at TTP El Paso, a man in his mid-40s who had a soft tissue sarcoma in his leg. She diagnosed the patient, served as the primary surgeon for tumor removal and reconstruction, and now continues to care for him during recovery. But the doctor’s most memorable patient yet was a young girl from Las Cruces, New Mexico. The 11-year-old had a bone tumor in her leg. It was benign, fortunately, but was still causing significant pain in the girl’s day-to-day life. Dr. Kafchinski intervened and removed the mass; the procedure was a success. After recovering — and without the prompting of her mother — the little girl wrote a thank you letter to the orthopaedist. Dr. Kafchinski holds a B.S in Nursing from Georgetown University and an M.D. from the University of Nevada. She completed a residency in orthopaedic surgery at the University of Utah. She joined Texas Tech University Health Sciences Center El Paso in September 2016 as an assistant professor.